The Territory Wildlife Park was lovely. 400 hectares of it all together. After not walking quite so far yesterday our little leggies were all fired up and ready to go again and we wandered around, happy to be doing our own thing. All the animals were residents of the NT, some were endangered species there for a breeding programme or because they had been injured. Some of the animals were introduced species that were being ushered out of the wild and into farms. We looked at the animal nursery/hospital, water buffalo, Asian cows, deer, wild pigs and then a nature trail to Goose Lagoon. Most of the path to this was on a raised walkway, I guess so that it could still be used in the wet season. It ended in a ‘hide’ where we could look out over the lake and see the birds and the lilies. It was a massive lake. We could see both sides easily enough, but the far side was a long way in the distance. There were all sorts of birds, and they couldn’t really see us, so were carrying on as normal. We could see the tide mark on the hide stilts from the wet season. It sure came up a lot higher, and the walkway would probably still get underwater. We noticed some dried reeds bent around a tree trunk at an impossible height and realised that this was the high water mark! Yet another reason for looking in the air which became a habit every time we were near water. Some of the evidence was way above our heads in some places. It would certainly be an experience to go back and have a look at it in The Wet. We had now walked about 2 kms and it was quite warm, and lunch time, but there was feeding at the aquarium, so we caught the little tractor-train for the next 500 metres and hopped off at the aquarium. We’d missed seeing the dingo and camel enclosures on the way because of getting the ‘train’, but that didn’t matter. Through the doors, the aquarium started with a little tank at waist height with some little turtles in. Slowly the floor sloped down and the tanks that we were looking through the sides of got bigger and bigger. There were all sorts of fish and a couple of baby crocodiles all in really nice, natural looking environments, with trees and plants hanging over the water above our head height, and real sunlight coming in from above. Then we got to the main, largest part of the aquarium. This was a walk through, like AQWA in Hillarys [a Perth suburb 5 mins drive from our home and we have not been], so that we were walking through a perspex tunnel underneath the fish. There were big barramundi, a large ray and shark and lots of other colourful and interesting fish. Also a strange one wearing a scuba tank which looked to be part of the feed. Admittedly, after seeing very few other people in the park so far, they had all come from nowhere and it was hard to get a decent view. Never mind. We waited for the crowd to move along after the feeding was finished, and then started the slow slope back up, looking at the displays along the way. 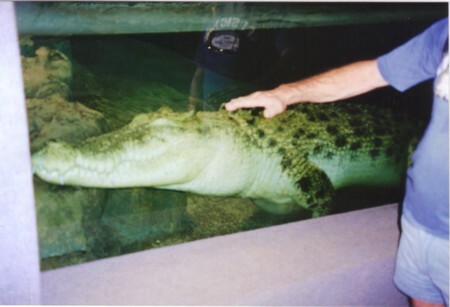 One was a full size crocodile, fast asleep right next to the glass. He sure was a whopper, but looked very sweet and innocent with his little eyes and big mouth tight shut. It’s amazing how their teeth and mouth are shaped to one another to keep it water-tight. If he broke a tooth would he drown? Now we waited for the next tractor-train to come around and climbed on with everybody else to go back to the beginning for lunch. The café was pretty busy, but took the crowd well and we had a pleasant enough meal and plenty to drink. You sure appreciate liquids in the warm weather. I don’t notice normally because the warm comes slowly, but of course this was more sudden because we’d flown to the warmth which was out of season for us. We couldn’t believe that the boys were still cold and wet at home in Perth. After lunch we waited for the train again and went back to where we’d gotten off and continued our walk refreshed. This time we walked through a collection of aviaries and then through some double doors into a huge walk through aviary. The path climbed steadily until we were up amongst the tree tops and looking down on the waterfalls and ponds below. The bird calls were lovely, but the birds themselves harder to spot. It was quite humid and tropical in there although it was not climate controlled in any way except for the number of lush plants. It was just a mesh enclosure. Eventually the path came down again and led into a monsoon forest walk. This was lovely. There were lots of very tall, slim trees and palms and bamboo. The sun was way up above the tall trees, and again we were walking on a slightly raised path. This time, we think, to protect the undergrowth and to keep the visitors out of the way of the wildlife. I really enjoyed this walk and the path crossed a stream several times which was very picturesque and the natural light was very green which made the water look lovely. It was now almost time for the birds of prey display, so we sped up our walking and caught the little train again to get us back to the beginning. Then a short walk and we took a seat in the open air stand. This was a talk and demonstration by 2 rangers with an osprey, a white bellied sea eagle and another eagle – can’t remember what kind. This was informative, but not worth recording here. When we went to get up at the end we were stiff again – we’ll call it the Darwin Walk. It was also now getting close to 4pm. We had to get the car back before the hire place shut at 5, because we were going on another coach tour before it opened the next day. So we missed the reptile area and nocturnal house, which was a shame. The brochure said to allow at least 4 hours to see everything in the Park and we were there for 6 and could have stayed longer! We got back to Darwin in time to hand the car in and then the usual routine. Back to the hotel for coffee and iced water, reorganise what we were carrying, and out to walk around town and decide where to eat. We were looking for a particular restaurant that we both knew we’d seen, but couldn’t quite place. We walked up and down most of the roads and were getting a bit tired and grumpy. When we got back towards the hotel as far as Delicious Blue we decided to eat there again as the food had been so nice the last time. This time I had the Bombay chicken curry and David had barramundi. He was most impressed with the ‘barra’ having always thought that a fish was a fish, and not seeking them for his dinner very often at all. We finished with just coffee to save a few pennies for another day. Then ‘home’ ready for an early start in the morning. We rang Perth and had a chat with Daniel, although the reception for our mobile phone wasn’t brilliant in the hotel. Then set the phone/alarm for 5:30 and it was time for some zzzzzz. The coach was to pick us up at 6:30 in the morning to go to Katherine Gorge.